Covestro is one of the world’s largest high-tech polymer producers, implemented a programme for noise-free, efficient supply chains while delivering customer value. KPIs have been improved with significant financial benefits. 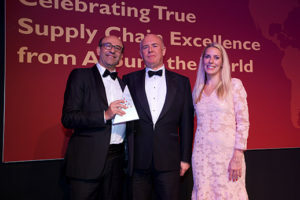 From left: Michel Ramis, Executive VP Sales and Marketing at Futurmaster, presents the Supply Chain Visibility Award. Logistics Manager editor Malory Davies, accepted the Award on behalf of Wed2B. Also pictured is Sara Pascoe who hosted the Awards evening. Granngården, the garden and pet supplies retailer, runs a multi-channel operation; buying from 450+ suppliers; selling through 111 stores in Sweden, online, mail order and 250 distributors. It worked with Relex to improve its forecasting and order proposals, channel availability and use automated replenishment for routine items. Amway India was scouting for an IT solution that could help it gain real time visibility of its 3PL partner network and could help it keep customers engaged at every step once an order was placed. It chose FarEye as its partner-of-choice to streamline its operations and gain real-time visibility. Belron is a major global player in the replacement windscreen market. This visibility project involves cross-functional collaboration enabling supply chain data to be visible for everyone. As a result supply chain has gained importance and top of mind in the business. Wed2b, the bridal retailer, operates on a low stock inventory relative to sales. The implementation of an RFID stock monitoring solution has been fundamental to providing greater, and more accurate visibility of stock at every point throughout the supply chain. The judges decided Wed2b just edged it for the win, while Belron was highly commended.